Did you know that besides doing wonders for your health, a certain nutrient group might also help you get rid of belly fat, keep you lean overall, provide you with energy to burn and reverse inflammation? Antioxidants can do that. Specific antioxidants found in fruits, veggies, chocolate, tea, wine and many more, help to ward off belly fat, inflammation and increase energy. Antioxidants are nutrients — including vitamins like E and C — that prevent or slow oxidative damage throughout the body. Antioxidants act as free radical bounty hunters that prevent and repair damage done by the free radical. Free radicals are oxidants and are a result of normal metabolic processes (such as with our mitochondrial function) in the human body or from external sources such as exposure to X-rays, cigarette smoking, air pollutants, industrial chemical chemicals. Chronic inflammation is the core cause of most every illness or disease (including aging). Even weight gain itself is a result of inflammation – the silent inflammation of fat cells that reduces metabolism and promotes health conditions as well. When you reverse or reduce low-level inflammation, you are increasing every aspect of your health on a cellular level <=== This is key. You are increasing your mitochondrial health which are the tiny engines or the ‘batteries’ that run the cell. Without our healthy mitochondria, you begin to gain weight, become fatigued and increase vulnerability to disease and we are not even addressing mental wellness. We essentially are our mitochondria…if they are not healthy, we suffer. Short sleepers need more antioxidants. Recent research shows that the combination of low antioxidant intake and a lack of sleep promotes obesity. Higher antioxidant intake could lower the chance of obesity simply by increasing antioxidant intake. These phytochemicals help to curb belly bulge by improving the body’s metabolism, help fight aging by preventing — and repairing — cellular damage. The major sources of polyphenols in the average diet are flavonoids. 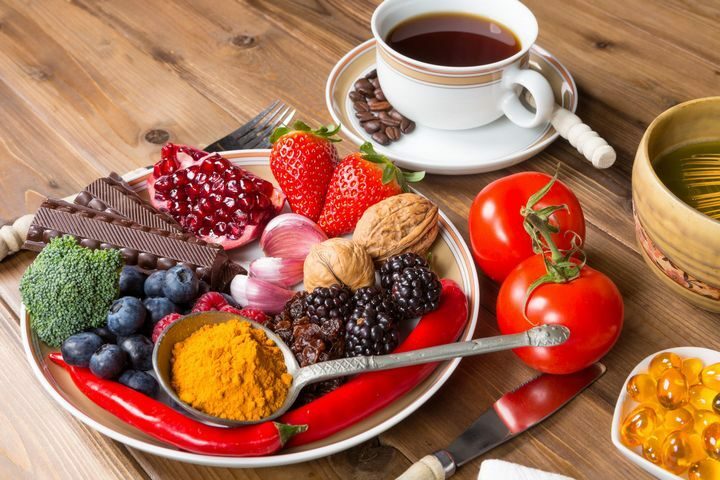 Flavonoids, are powerful antioxidants, even more powerful than vitamins C and E combined that also have anti-inflammatory effects that can protect against dementia, Alzheimer’s disease, and cancer. The human body does not produce antioxidant vitamins naturally, so it is vital to add them in our daily intake of food, be it through foods or supplements. Common antioxidant vitamins include vitamins A, C, E, folic acid, and beta-carotene. Including a wide array of flavonoid foods to your diet will promote a leaner and healthier you. Enzymes are types of antioxidants that come from the protein and minerals we eat as part of our daily diets. These enzymes are synthesized in the human body, and in order for antioxidant enzymes to provide optimum antioxidant activity, they require co-factors such as iron, copper, selenium, magnesium, and zinc. The quality of the protein source we eat does have an impact on the quality of the antioxidant enzymes. So where can you get your fair share? Apples, cherries, cinnamon, turmeric, tea, chocolate, beans, onions, garlic, leeks, and sweet bell peppers, all berries (blueberries, strawberries etc), plums, spinach, beans (especially lentils), Brussels sprouts, broccoli, citrus fruits, watermelon, Pretty tasty choices! You read that right: There is a type of water – ionized alkaline water that acts as an antioxidant within the cell. One of the greatest benefits of alkaline ionized water, is the ability of H2- antioxidants (also called molecular hydrogen) to penetrate cell walls and do their work where no other antioxidant can. One reason H2 antioxidants are the most powerful antioxidants is because they are so tiny. These microscopic antioxidants can enter cells and give their benefits directly into them. No other antioxidant can do this. Another amazing feature of molecular hydrogen is that it can bond with other antioxidants, such as vitamin C or E after they have been “used up”, and regenerate them. 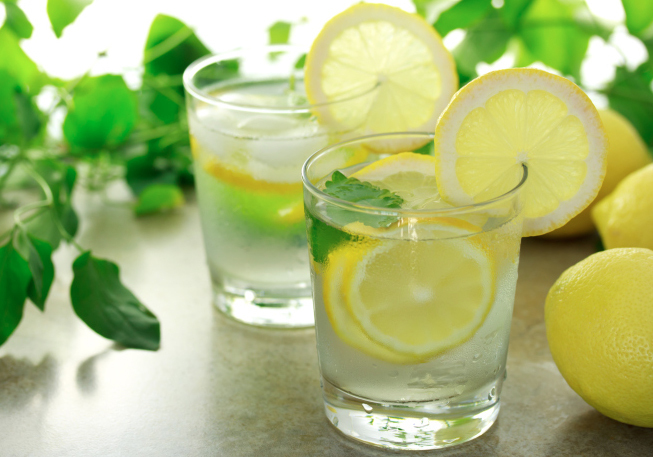 Adding lemon to your water is also alkalizing to help keep you free from disease, inflammation and weight gain. Lemon peel contains pectin, a soluble fiber that has been shown to help with weight loss. Add an ounce of lemon juice and some zest to each of your eight daily glasses of water (which will help you feel fuller) as the pectin in the lemon turns to a gel that helps balance blood sugar – stopping hunger and cravings.